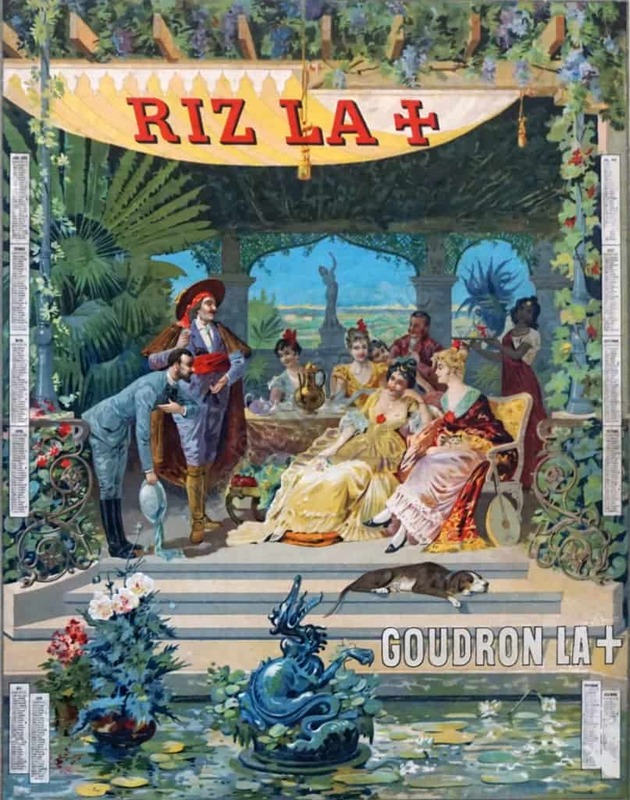 This is a French Belle Epoque period advertisement calendar for Riz La from 1898. It is a wonderfully colorful, exceptionally detailed, and exquisitely made scene of a group of elegant French men and women relaxing in a garden room. A dog sleeps on the steps in front of the group; a sculpture, a large amount of lily pads, and a collection of flowering plants sit within a pond in the foreground of the image. The group is composed of several beautifully dressed women sitting around a table, with two men introducing themselves to two of the seated ladies. The exquisite greens, blues, yellows, and reds make this delightful image pop; the Riz La + logo sits at the top of the image in a bright red typography. Small monthly calendars perfectly frame this Belle Epoque period advertisement from 1898.